Sydney Moss' odyssey has taken her from playing in Division I at the University of Florida to achieving a milestone in Division III. CRESTVIEW HILLS, Ky. — A sophomore scoring an NCAA Division III single-game record 63 points is a great story. Considering the player is Sydney Moss, there are more layers to it. It’s not everyday you find a former Kentucky "Miss Basketball" at this level. But welcome to a story about a player having fun again while also showing NCAA shortcomings. Others would be more blunt and call it hypocrisy. We haven’t even included the famous father yet. Moss is averaging a Division III-best 28.6 points per game for Thomas More College (28-0), who enter the NCAA Tournament as the top-ranked team. "When I got here, everyone welcomed me with open arms and I played with some of the girls in high school," Moss said. "I think right away I felt very comfortable with the girls and it just grew." Moss and the Saints needed each other. Moss wanted to return home and be closer to family after getting homesick at the University of Florida. Thomas More has long been a successful program, winning eight straight Presidents’ Athletic Conference titles, but have never advanced beyond the Sweet Sixteen. They lost in the first round last year and had a pretty talented core of players returning, but the addition of Moss has made them a force. "It was like everything was meant to be. It was like a puzzle, she’s the missing piece. We have the guards, we just needed that rock," said junior guard Sydni Wainscott. Coach Jeff Hans said he knew that Moss found a home when she said before Thanksgiving that the team felt like a family. "I treat her like a daughter but I probably yell at her more. Every player needs that to be comfortable to have success," he said. In Greater Cincinnati and Northern Kentucky, Moss has always been regarded as a talented player. At Boone County High School, she scored 2,997 points and had 1,602 rebounds en route to being named Kentucky’s "Miss Basketball" in 2012 along with state Player of the Year honors by the Associated Press and Gatorade. Almost every article though also mentions that she is the daughter of former NFL wide receiver Randy Moss, who contributed to Fox Sports NFL coverage this past season. If you do a search on Google, most of the headlines after last Friday’s game against Waynesburg say Randy Moss’ daughter. If you ask Sydney Moss’ friends and teammates about her dad, they are very protective. "She knows all of her personal experiences. These are her accomplishments, not his," said Wainscott, who has known Moss since AAU ball. "He isn’t really a part of her life. He isn’t here cheering her on and witnessing the things she’s accomplishing. So why are there pictures of him on all her accomplishments? We just don’t get it. Those things are going to happen. She’s her own person and we respect and appreciate that. We wish others would also." The best way to describe the current relationship is on and off. Hans said the only thing he knows about the relationship is that they talk occasionally. Besides her teammates, it has been Moss’ mom — Libby Offutt — and her side of the family that have been the greatest influences. Her grandfather, Frank Offutt, was the male presence in her life and attended every one of her high school games, making the seven-hour drive from St. Albans, W.Va., to Northern Kentucky. Grandpa Frank was a pretty good basketball player of his own. When he attended West Virginia University, he was a member of the freshman team and then officiated high school and church league games. Frank and his wife, Sissy, were long-time coaches of the girls basketball program at their church. With a rising program and some family already down there, Moss thought playing for the Gators would be a good fit but shortly after arriving in Gainesville she got homesick. It got worse after her grandpa died. When Frank got sick in the fall of 2012, the staff at Florida would not allow her time to visit. He died on Nov. 28, 2012, following complications from surgery. On the court, it looked like everything was going well. She started 24 games and was second on the team in scoring at 11.8 points and led them in assists with 143 while being named to the SEC’s All-Freshman team. Off court though, Moss wanted to be closer to family and was angry that the coaching staff didn’t talk to her mom once during the season. Cincinnati, Xavier, West Virginia, Kentucky and Louisville would have loved to have Moss, but Florida coach Amanda Butler would not grant a transfer to another Division I school, which would have made Moss eligible to play immediately. Moss did not want to sit out a year. With less stress of playing, a smaller campus and being closer to home, she chose Thomas More in late June. When asked about a college system that allows coaches to go from school to school without repercussions, Moss said she understands some of the transfer rules but wishes there was some leniency. "If you had no transfer rules then you would have a ton of powerhouses," Moss said. "I think there should be reasons why you shouldn’t have to sit out a year — family death, getting closer to home. But if you are transferring to a school that just won a national title and it is for that reason then there should be rules." Wainscott had kept in touch with Moss at Florida and was happy to see her friend come back. "Being so family oriented, she missed her siblings and her mom," she said. "She was getting to that point where everything was making her mad. She was still on the borderline but with her attitude she was ready to be home." Earlier this season, Moss scored 40 against Waynesburg. Last Friday’s game, which was a semifinal in the PAC Tournament, did not start well as Moss missed her first two shots but a steal and assist to Devin Beasley for an open layup got things going. Moss plays both forward and guard, and moving her into the paint also opened up some opportunities. "I was struggling a bit, but we started doing more full-court press," Moss said. "I threw a behind-the-back pass to my point guard and she hit the layup. We did a chest bump and I knew we were going to take off from there." Moss then made seven of her next eight from the field and had 29 points at halftime. It wasn’t until Moss scored 55 that sports information director Cory Blackson told one of the assistant coaches that Moss was near the record. With 18 seconds remaining, Moss hit a pair of free throws to break Ann Gilbert’s 23-year old mark. Gilbert scored 61 for Oberlin College against Allegheny on Feb. 6, 1991. "There was nothing extraordinary we were doing," Hans said. "She was just very comfortable down on the block and our players just kept giving it to her. She just kept finishing and made plays. She put the team on her back and carried us to the win." Moss didn’t know anything about the record until near the end of the game and it was announced to the crowd. Her grandmother, who had hip surgery a week ago, was watching the game online from her hospital bed and was the first to call and congratulate Moss. Her mother was at the game. There were also plenty of congratulations on Facebook, Twitter and Instagram. Said Wainscott: "She said after the game ‘it is because of you guys.’ It’s never about her. It is about her but she never makes it that way. She’s a good person and it was great to be part of it." Watching Moss’ game and with the mohawk, her game might bring comparisons to one of her dad’s high school teammates, Jason Williams, who had a 12-year NBA career. From the behind-the-back passes to getting the ball to her teammates to taking a game over, there are a lot of similarities. Moss’ greatest improvement has been in her shooting, as she has developed more of a perimeter game. She had to develop that mainly playing guard at Florida. She is more comfortable in the paint though as a forward, where she can take over games. Even Moss admits that "driving to the basketball and seeing the floor well along with passing" are her strengths. "Syd is the type of player that is relaxed but when you make her mad at practice or the court then she starts taking over. It is kind of a lose-lose for you," Wainscott said. 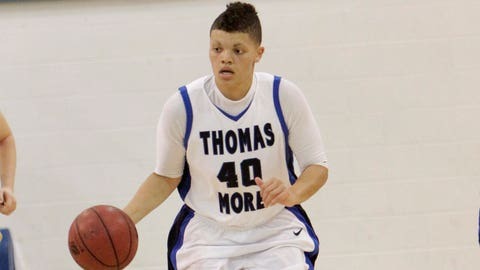 With Moss, Thomas More should be favored to get to the Elite Eight or beyond for the first time. The Saints host Salem (N.C.) in the first round on Friday. The winner will face either John Carroll or Texas Lutheran for the right to advance to the Sweet Sixteen. "I hope we go all the way but you just have to focus on the one game at a time," Moss said.